This easy berry spread is perfect for entertaining as you can make ahead and refrigerate until service. 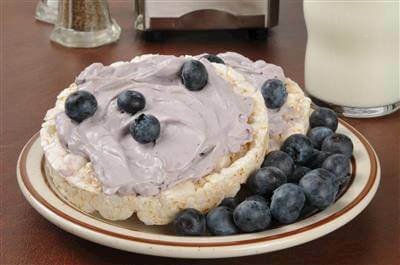 With just blueberries, cream cheese, granulated & confectioner's sugar, you can make this delicous spread! Just make sure that the blueberry sauce is cool enough before mixing in the cream cheese. RecipeSavants.com This easy berry spread is perfect for entertaining as you can make ahead and refrigerate until service. With just blueberries, cream cheese, granulated & confectioner's sugar, you can make this delicous spread! Just make sure that the blueberry sauce is cool enough before mixing in the cream cheese. Smart Recipes, American Recipes, Dairy Recipes, Recipes Dairy American Blueberry Schmear PT20M Serves 1 Ingredients: 0.5 Cup Fresh Blueberries 16 Ounces Cream Cheese 0.25 Cup Granulated Sugar 0.25 Cup Confectioners' Sugar In a small pan, add blueberries, granulated sugar and 1/2 tablespoon of water and bring to a gentle boil, stirring occasionally. Cook for 3-4 minutes. Remove from heat and transfer to a heatproof bowl. Keep aside to cool. In the bowl of an electric mixer, place cream cheese and beat for 1-2 minutes. Slowly, add sauce, a little at a time and mix until well-combined. Add confectioners' sugar and mix until smooth. Transfer the blueberry cream cheese into a serving dish. With a plastic wrap, cover the dish and refrigerate before serving. Serve with the garnishing of fresh blueberries. A splash of lemon juice gives this dill spread made with cream cheese a tangy flair. Parsley and green onions are the other staring ingredients in this delicious spread that you can use on morning sandwiches or as a dip for your veggie chips. 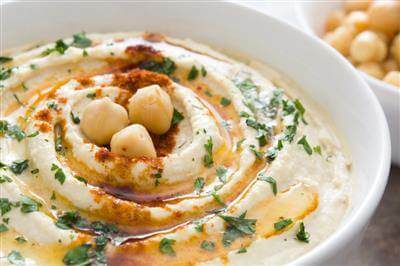 Surprise your vegan guests with this lovely vegan-style hummus. 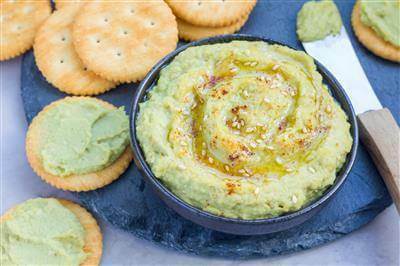 Instead of using chickpeas like traditional recipes, this hummus features pureed edamame beans and avocado. These are mixed with tahini, lemon juice, and aromatic spices. It has a beautiful green hue, and a nutty crunch, thanks to toasted pine nuts. This recipe is healthy, delicious, and attractive in a serving bowl.